NORMAL, AL – Needing some late game buckets to get over the hump Texas Southern got a big boost from Aaron Clayborn on Saturday night as he scored 18 points helping TSU knock off Alabama A&M 64-62 on the road. With the win TSU kept pace in the SWAC regular season title race. The Tigers (14-14, 13-2 SWAC) held a 58-46 advantage with 7:56 remaining. Alabama A&M would attempt to make a run cutting into Texas Southern’s lead but Omar Strong ended the run with a layup bringing the score to 59-56 with 3:34 left in regulation. After a Bulldogs’ layup brought the score to 59-58, Texas Southern tallied four straight points for a 63-58 lead with 2:02 remaining. Alabama A&M converted 1 of 2 free throws to take the score to 63-62 with nine seconds remaining. Texas Southern’s Lawrence Johnson-Danner grabbed the rebound after the miss free throw attempt and was fouled. He would subsequently hit 1 of 2 at the line giving the Tiger’s a two point lead. 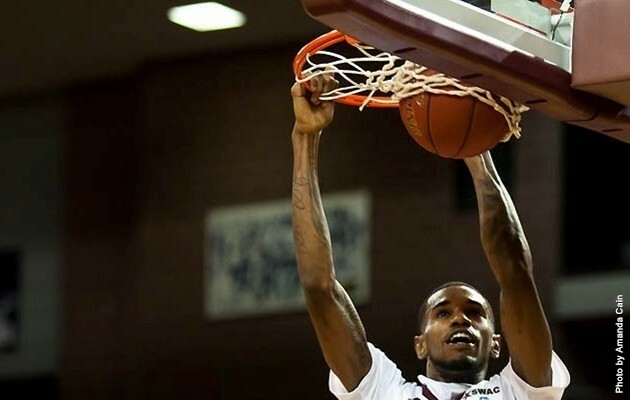 A desperation shot for Alabama A&M was no good as Texas Southern got a big win on the road. For the night Clayborn was 9-of-11 shooting from the field while Ray Penn added 11 points and Fred Sturdivant contributed 10 points. Sturdivant made several game changing plays on the defensive end of the floor rejecting a total of five AAMU shots in 31 minutes of play. Texas Southern outscored Alabama A&M inside the paint 36-30 while also outrebounding the Bulldogs 35-34. The Tigers shot 49 percent from the floor while holding Alabama A&M to 43 percent from the field. Texas Southern will get set to face Alabama State on the road on Monday at 7:30 pm. The Tigers will return home on Thursday as they are slated to host Southern on Thursday, February 28 at 8:00 pm at H&PE Arena. Omar Strong made a three-point basket for the 60th consecutive game which is the current longest active streak in the NCAA. Fred Sturdivant tallied five blocked shots against Alabama A&M. The Tigers had a total of three players score in double figures against Alabama A&M.